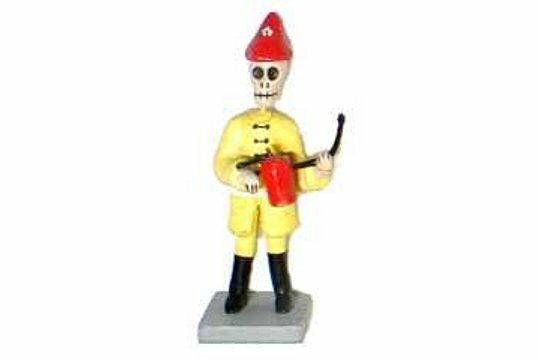 Protecting us alive or as a Muerto, our Day of the Dead Firefighter holds a piece of firefighting equipment, usually a hose, perhaps to quell the fires of purgatory or worse? Just like the rest of our Day of the Dead Figurines, each of these Muertos is hand sculpted and painted by traditional artisans in Mexico. He measures between 2-1/2 and 3 inches high. Uniform and helmet colors vary.